Ray Clemence and Bruce Grobbelaar were sat together at Anfield and it was no stretch to re-imagine the former Liverpool goalkeepers as those old curmudgeons from the Muppet Show, Waldorf and Statler, ripping into the failings of today�s generation. Loris Karius�s teething troubles continued while Darren Randolph reacted to the final whistle by burying his head in a towel. The West Ham United keeper�s despair was understandable but, for his manager, humiliation has given way to hope. Slaven Bilic has been under intense scrutiny since the 5-1 home defeat by Arsenal and endured an ominous start at Anfield when Adam Lallana swept Liverpool into an early lead. West Ham�s reaction was not that of a team calling time on their manager. Bilic�s name resonated several times from the away end and his players gave what they could to alleviate the pressure. No cause was lost as Dimitri Payet and Michail Antonio edged the visitors ahead by the interval. 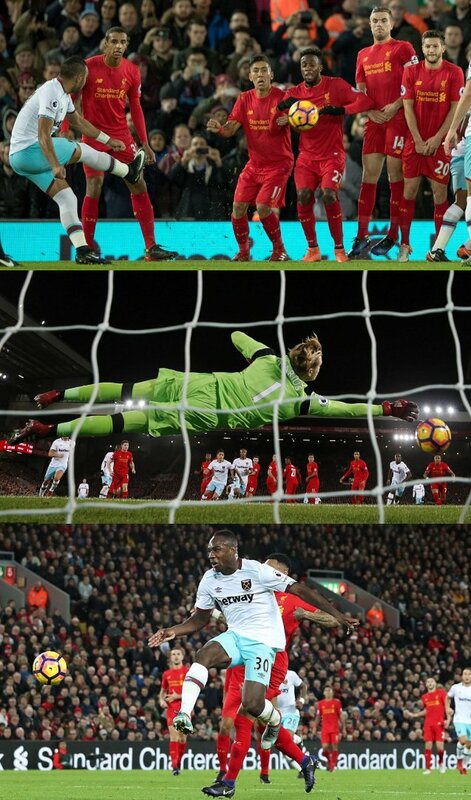 They were under siege throughout the second half and cracked when Randolph gifted an equaliser to Divock Origi but, with Winston Reid and the goalkeeper impeccable thereafter, they held firm. It was J�rgen Klopp who had cause for concern after Liverpool�s latest suspect defensive display. The Liverpool manager may have been enraged by Steve Cook�s admission that Bournemouth targeted Karius as the weak link in last Sunday�s 4-3 reverse but his goalkeeper�s struggle to convince otherwise is the bigger problem. His 23-year-old�s positioning at Payet�s free-kick was questionable and his reactions slow for Antonio�s goal � though he was not the only Liverpool player culpable on that score. West Ham started like a team shorn of confidence and their defensive organisation was non-existent as Liverpool prospered from their first meaningful attack. Sadio Man� exchanged passes with Origi and reached the byline without a challenge in sight. The Belgium international forward just failed to connect with an inviting cross but it dropped to Lallana who, with Angelo Ogbonna ineffectual and Reid static, had time to control and beat Randolph with a low left foot finish. Just as defensive frailties persisted in the visitors, the same was true of the hosts. Karius and the defenders around him were again vulnerable under minimal pressure, as in the late collapse at Bournemouth, and Bilic�s forwards found encouragement to haul their team back into the contest. A routine clearance from Reid was sufficient to give Antonio the visitors� first shot on goal with Liverpool wide open at the back. Karius saved on that occasion but was found wanting when West Ham levelled through Payet. The intentions of the France international were abundantly clear as soon as Lallana tripped Pedro Obiang 25 yards from Liverpool�s goal. Not that being forewarned aided the Liverpool goalkeeper. Having sized up the free-kick in a central position Payet curled his effort over the wall and a yard inside Karius� right hand post. The Germany under-21 international got a hand to the free-kick but, having positioned himself too far to the left, was unable to deny the set-piece specialist. West Ham�s second was far worse from a Liverpool defensive perspective. Bilic�s side were the more threatening team as the first half wore on and their prodigious work-rate, typified by Mark Noble chasing down a lost cause and winning a corner from James Milner, was impressive. But they were gifted the lead when Havard Nordtveit�s cross deflected off Jordan Henderson�s head and wrong-footed the otherwise commanding Jo�l Matip. Neither Karius or Nathaniel Clyne reacted quickly enough to the danger and Antonio was given the freedom of Liverpool�s penalty area to flick the ball around the keeper and watch it trickle over the line. To their credit, Liverpool dominated thereafter with Roberto Firmino twice going close before the interval and Payet fortunate not to concede a penalty with a risky push on Lallana. They drew level courtesy of the biggest goalkeeping error of the game when Man� crossed from the left and Randolph, coming to claim at full stretch, let the ball fall from his grasp on to the toes of Origi. The Liverpool striker could barely believe his luck as he converted via the inside of a post from four yards out.